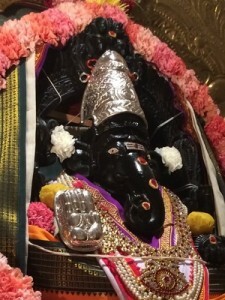 The Broome Street Ganesh Temple was established in 2001, under the guidance and with the blessings of Sri K. Pattabhi Jois, of Mysore, South India. The ceremony was performed fourteen days after the tragic events of September 11th, and was commenced with a public Vedic prayer service for those who perished, and for those deeply affected by loss. It was an important and powerful time for a traumatized lower Manhattan to gather together in prayer, and to begin building a spiritual base amidst the smoke and sadness that hung over the streets of New York. 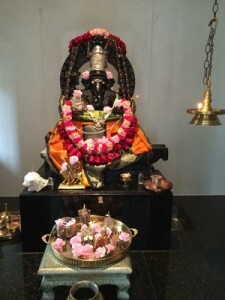 It was, to knowledge, the first Ganesha temple in Manhattan consecrated in accordance with Vedic rituals. During the ensuing years, the installation of Bhakta Anjaneya (Hanuman) was performed, followed by the installations of the Siva Linga and the Durga Cave Temple. These beautiful temples provide both seekers and devotees the unique opportunity to exit the frenetic energy of Manhattan and enter a tranquil and beautiful space, wherein one can feel peace, calm and a connection to the timeless culture of India’s spiritual traditions. The Broome Street Ganesha Temple is a traditional South Indian Hindu temple, located in Soho, NYC. Our space is a hidden and sacred sanctuary in Manhattan, where all are welcome to come worship, reflect, and find peace in the midst of our hectic lives. The Broome Street Temple is a place for both personal and communal transformation. It serves as a link in the continuance of vital ancient traditions that are healing and devotional in nature. It is the goal of the Broome Street Temple to engage in the following endeavors: to preserve traditional lineages, and to encourage knowledge, devotion and charity in ourselves, as well as fellow human beings. Temple worship is a devoional and meditative service to the deity that encourages a state of love, surrender and communion with the divine. Daily services are performed in a traditional manner in accordance with the Smarta and Gaudiya lineages. Additionally, other festivals are held in observance of certain key Hindu Holidays. In the ancient texts charity is praised as being both helpful to those in need, and purifying and necessary for the benefactor. The temple will partner with local charitable organizations to help support the mission of feeding the hungry and housing the homeless. The activities of the temple are rooted in the literature of India’s ancient texts, the instructions of which are revered to be a manifestation of the divine. Contemplating the teachings of texts such as the Vedas, The Mahabharata, the Ramayana, and the Puranas is a joyful way to gain direction, purification, and inspiration. 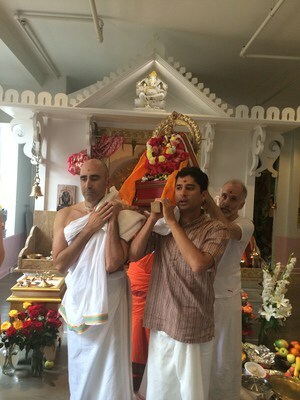 At the Broome Street Ganesha Temple we take joy in maintaining and sharing the traditional practices of our lineages. The devotion that has manifested in the temple has created a unique and spiritually resonant space for those seeking refuge from our busy and crowded world. It serves as an ideal setting for satsang, a central idea in Hindu thought — keeping the company of like-minded people for the purpose of elevating the mind and spirit. Being among such people, we gain courage, enthusiasm, happiness, and surrender.